Greasy Joe's is a diner and restaurant in Grand Theft Auto III, located in Callahan Point, Liberty City. Primarily selling liquor, Greasy Joe's is regarded as a hangout for corrupt and undercover cops. The diner used to be a Rusty Brown's donut shop as recently as 1998 in Grand Theft Auto: Liberty City Stories. In GTA III, a Kuruma, Moonbeam, and Linerunner are parked there at all times; a police bribe is also located on the roof. 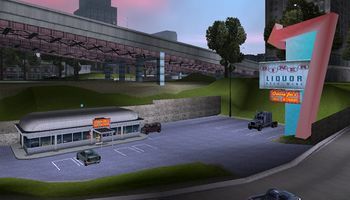 Greasy Joe's is one of the destinations for the game's taxi missions. Greasy Joe's makes an appearance in Grand Theft Auto IV on Lyndon Ave in Alderney City, Alderney. This page was last modified on 11 March 2017, at 15:01.